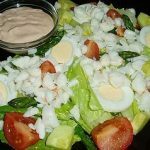 Crab Louie is a Pacific Ocean treasure salad. You can also substitute or combine Shrimp Meat to this salad. You will also find the spelling for Crab Louie as Crab Louis. Shred lettuce of your choice. Make a mound of lettuce on each plate. Place Crab Meat (Shrimpmeat) on the top of the bed of lettuce. Top with Louie Dressing. Arrange the tomato wedges, slices of hard boiled egg, and black olives around the outer portion of the plate. Sometimes I cut the eggs into wedges and other times as circles.